A 70 yo male with recent onset low backache. 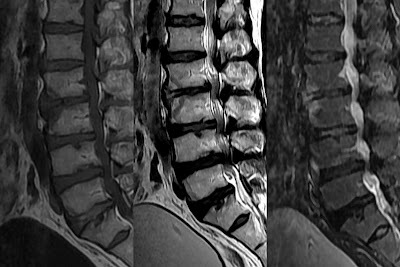 MRI sag T1, T2 and STIR screening shows multiple level severe degenerative changes, canal stenosis and thecal sac compressions. At L2-3 anterior portion of disc show abnormal high signal on T2 and STIR. Adjacent endplate erosions best seen on T1 as ill defined endplate margins. Altered marrow signal involving adjacent anterior corners of L2 and L3, signal abnormality is low on T1, intermediate to high on T2, obvious focal T2 hyper intense marrow edema on STIR. No marked prevertebral soft tissue. Imaging wise this can be attributed to a typical changes of Spondylodiscitis. Spine infection can be a Spondylodiscitis or Vertebral osteomyelitis. The term Spondylodiscits is used when there is discal and adjacent paradiscal involvement. Term Vertebral osteomyeltis is used when there is single or multiple and contiguous involvement of vertebral bodies. Pyogenic Spondylodiscitis typically involves disc and anterior corners of the adjacent vertebral bodies near endplate. This appears to be due to the segmental nature of the blood supply, arteries bifurcate to supply two adjacent vertebral bodies. In children, the presence of vascular channels that directly feed the disk allows for direct hematogenous infectious seeding to the disk. In adults, the direct blood supply to the disk is reduced and so the disk involvement occurs secondary to direct spread from the vertebral body after the adjacent end-plate is destroyed. Sometimes , spondylodiscitis affect only a single vertebral body with or without disc involvement and this may lead to diagnostic confusion. Tubercular infection of spine shows two distinct patterns of vertebral tuberculosis. The classic pattern is spondylodiscitis, characterized by involvement of corner of contiguous vertebrae, their opposed end plates and intervening disc, an associated paraspinal mass or collection. The second pattern is multiple and contiguous involvement of vertebral bodies without disk involvement, is atypical and increasing in frequency. An associated large paraspinal abscesses, dystrophic calcification of para spinal soft tissue or abscess, posterior vertebral changes, greater bone destruction, collapses. MRI is the modality of choice for imaging of spondylodiscitis due to its high sensitivity and specificity ~ 96 and 93% respectively with its high soft resolution delineating cord and nerve roots. Diagnosing early stage Spondylodiscitis requires high index of suspicion, more difficult to diagnose the initial state of infection in patients with severe degenerative changes where back pain can be caused by other causes such as canal stenosis and disc herniation. The focus of early the infection seen as a signal abnormality at corners of vertebral bodies, low on T1 and intermediate to high on T2; may be overlooked and confused for Modic type I and II degenerative endplate changes. In such cases addition of Sag STIR will increase the sensitivity of MRI in diagnosing Spondylodiscitis which will show focal T2 hyperintense marrow odema where in modic degenerative changes at any stage marrow odema on STIR is uncommon. It is common to have Spondylodiscitis with subtle imaging findings or atypical presentations at an earlier stage infection. One can take help of follow up imaging before coming to any conclusion. Gadolinium enhancement of involved disc, adjacent vertebral body and surrounding soft tissues improves the diagnostic accuracy of MRI, but less commonly required for experienced eyes.